by Annemarie Yohnk for Quilts Remembered. Annemarie...my neighbor in nearby Burnsville, MN.. used fabrics I designed for Andover Fabrics....Dargate Treasury.. to create this charming wall hanging. 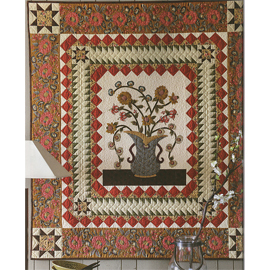 It is featured in the newest issue of Quiltmania # 112, page 74. She combined broderie perse applique and piecing for the center portion of the project...and then finished it with a dramatic printed border. We have kits, issue # 112 of Quiltmania...plus both rulers recommended by Annemarie. Further development of roller printing equipment and techniques led to the popularity of fancy ground covers in 1820-30s. The early chintz prints were usually on plain or colored backgrounds. Other options were a speckled pink ground, popular with the Dutch trade, in the early 18th century and a subtle vermicular, endless meandering lines also called worm, or seaweed design as a background or border print in the late 18th century. The overall design were printed with a weak mordant and showed as a pale background. Sometimes it was done alone with the fabric then used as a lining. This type of background design was revived as a honey comb motif in 1815-20. The workshop of Joseph Lockett of Manchester, England was known for their cylinder making and engravings. 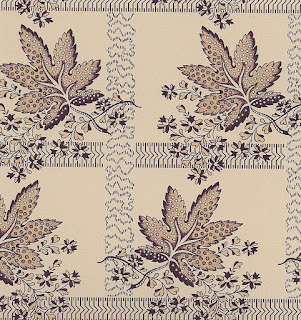 By the 1820s he offered a wide range of delicate overall designs to be used as cover rollers. Strike offs of much of his work from 1806-1840 remain. A meander, a subtle stripe or plaid or overall fancy grounds were added to many floral prints from 1825-1860. Often an initial roller printing was done for outlining or picotage shadings, motifs were then block printed. The print paste protected the first two steps when the yardage was again roller printed with a 'fancy ground' cover pattern. This final step could add an additional 1 cent/yard to the cost of production! 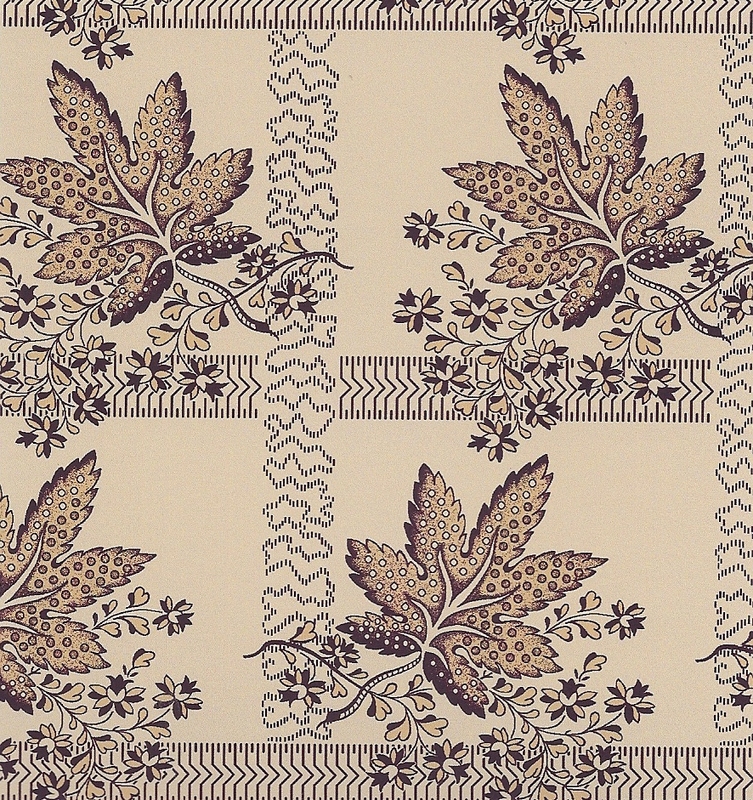 The above leaf design from my current 'in production' line, Traceries, features the look of c. 1830 fancy ground plaid.